Mark your calendars for 10AM PDT this Friday, July 27th! There are a very limited number of unclaimed tickets that will be made available on a first-come, first-served basis. Be by your computer or smartphone ready to click "purchase" right at 10AM PDT for your best chance at purchasing tickets. No promo code will be required. Best of luck! Rules & Regulations: The ticket limit is 2 per night, per household (billing address). Valid photo ID of the purchaser will be required to be shown at the venue. As with all birthday bash tickets, attendees must be 18 years of age or older. 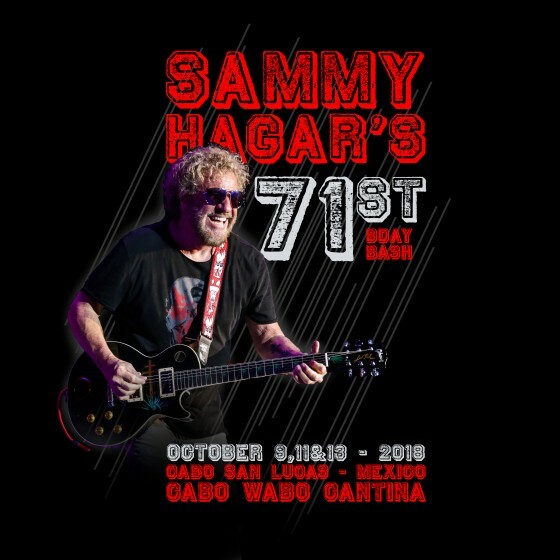 Finally at 50 I get my chance to see Sammy in Cabo. I'll be there on the 9th and have my ticket. If you have an extra, I will buy from you so I can take my wife too. I **MIGHT** end up with one extra ticket for 10/13.... if that is the case, is there anyone with an extra for either 10/9 or 10/11 who would like to trade that extra single for a single on 10/13? The only reason I say "MIGHT" is because I am not positive yet if anyone is coming with me, or if I am traveling solo. Link worked, got night one, so pumped! Thought I'd be there hanging out outside cabo wabo, feel so lucky, sold out right away! My link worked fine. I am so excited to see Sammy... My husband was trying also and he said his link didn't work either. Got in! Two tickets for Saturday!! Goin' to Cabo!! What a bummer!! ready at 9:59am and nothing!! was there only like 1 tix available per date or what? Need a better system. Will be there in Cabo whole week and no Sammy! I tried to get tickets, nothing was happening. Started refreshing at 9:59am. My wife will be bummed, she loves Sammy and we are down in Cabo that week. Sammy in Cabo would be a dream come true! Is there a place to sit? Or is it standing room only? I have difficulty standing for long periods of time. Is there any information on dinner ticket sales this year?